Its more of January floods topped up by a few heavy rain storms over the last few February days that’s caused these conditions. As I write this post, the wind is howling and more rain is pounding the window. I can look forward to more ‘water world’ landscapes although my farmer neighbours won’t be happy. Its also a celebration of the return of the sun, like the last painting. The colours used are exactly the same, Yellow Ochre, Burnt Sienna and Ultramarine Blue. As usual, I blended the sky colours to produce a misty soft look. This involves placing the colours and using a wide filbert brush to stroke the paint gently in every direction, sometimes at right angles to the previous stroke direction. There’s a lot of accidental shapes and random patterns, sometimes wanted and sometimes not. These times there is a need to coax the shapes more in line with what is required. It all looks a bit haphazard and there is knack to getting it right, but the result looks less contrived than a carefully constructed sky. The lower ‘land’ part is solid paint placed in definite structures to contrast the softness of the sky. In the flooded field there was a softness achieved by painting with ‘dry’ paint and brushing it into the weave of the canvas. Remember the same 3 colours are used in the sky and also the ground. 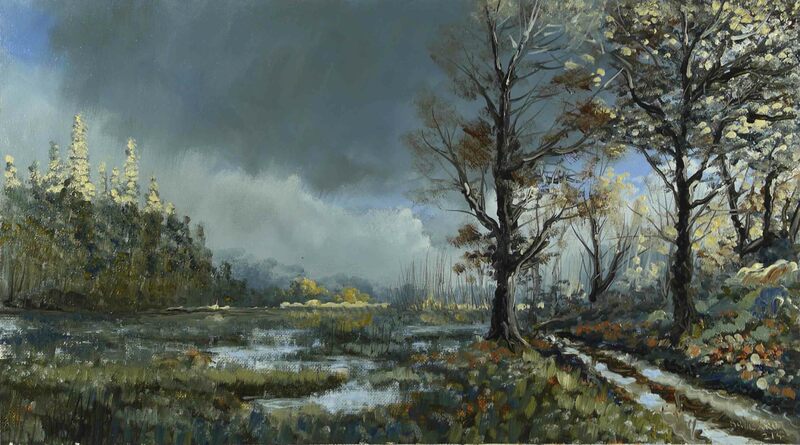 If I had used a different range of colours in each, the contrast between the excessive softness of the sky / flooded field and the gritty solid ground and trees would have been excessive. Check out the video to see what I mean. See you soon. This entry was posted in Oil Painting and tagged Art, Culture, Education, landscape, Oil Painting, Oil Painting Instruction, painting, Pictures, Time lapse painting. Bookmark the permalink. Brilliant. Love the sunshine on the left lighting those treetops. Every morning when you get to work first thing I do is log in to your blog to see that wonderful painting delight us. Are you great and your painting even more. Thanks for show it to us. My English is translated by google. Sorry. Thank you for the nice comment. Art is for sharing. Sounds like there’s been as much flooding across the pond as we’re getting in the U.S., now that all the snow is melting! I feel a little guilty rejoicing in the changes in the landscape when so many people are experiencing such hardship.